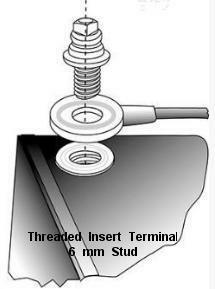 Terminal= Threaded Insert Terminals. (Direct replacement for the nut & bolt terminal. Allows for a low profile battery and makes it much easier to install your cables compared to using the nut & bolt terminals). Please note the information listed is for a single battery. Certain models/systems require two or more batteries. Please verify the amount of batteries you need. Under normal everyday use, most people need to charge their batteries every night. If the wheelchair is used only occasionally, the batteries need to be charged every 2 weeks and should be charged after every day use. Battery failure is the most frequent reason for electric wheelchairs to stop working or to start acting erratically. Taking proper care of batteries is very important. Wheelchair batteries are different from car batteries. 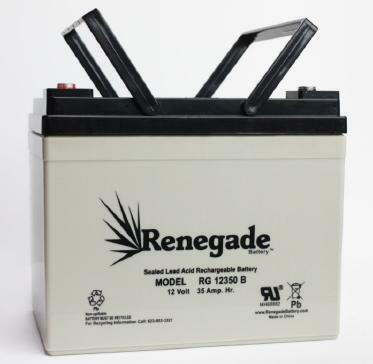 A wheelchair battery is charged once a day and supplies large amounts of electricity while it is running. Although manufacturers provide their own durability numbers, most electric wheelchair batteries last 1 good year - up to 2 years when properly maintained. The life of a battery is very dependent on how heavily it was used. DO and DO NOT'S from our experience! Always use the charger supplied with your wheelchair. Make sure it is set to the proper battery type and proper incoming voltage (US/EU 110/220V). If you need to store your wheelchair for a long period of time, it is best to charge your batteries at least twice per month. New batteries require conditioning. For the first 6 to 10 charge/discharge cycles, do not heavily discharge the batteries. Do not use automotive (car) battery chargers. Do not excessively discharge the batteries. Do not top off with frequent charges, as this is hard on the batteries. Whenever you plug in the charger, always check that the battery is charging, as indicated by a meter or light. The charger plug is subject to a lot of stress, so be sure that the cord and plug are in good condition. Extensive exposure to cold/hot temperatures will severely cut the capacity of your batteries and may even damage them. Some battery types cannot be recharged outside nominal temperature range.